Wilkes Allen was born 10 Jul 1775 in Shrewsbury, Massachusetts, USA. Wilkes Allen was the son of Elnathan Allen and Thankful Hastings. Wilkes Allen married Mary Morrill 20 Nov 1805. (both the "Walter Allen of Newbury, Mass" book and the "Family Register of Shrewsbury, Mass" book indicate he was married 13 Nov 1805, but the Vital Records of Chelmsford indicate 20 Nov 1805. Rev. Wilkes Allen was a clergyman. Rev. Wilkes Allen was a charter member of the Masons, Pentucket Lodge. He was Grand Chaplain 1824-1827. Rev. Wilkes Allen died 2 Dec 1845. The cause of his death was a fall down the stairs. Rev. Wilkes Allen was buried in Forefather's Burial Ground, Chelsmford Center, Middlesex County, Massachusetts, USA. Harris of Dorchester, in whose pulpit he preached his first sermon. In 1803 he received and accepted a call to the church in Chelmsford, where he was ordained Nov. 16 and remained until Nov. 16, 1832, when he retired from the ministry and spent his remaining days on a small farm in Andover, where his death came, caused by a fall down the stairs of his barn. THE HISTORY OF CHELMSFORD FROM ITS ORIGIN IN 1653 TO THE YEAR 1820--TOGETHER WITH AN HISTORICAL SKETCH OF THE CHURCH AND BIOGRAPHICAL NOTICES OF THE FOUR FIRST PASTORS. Tell ye your children and let them tell their children, and their children another generation.--Prophet Joel. Rev. Wilkes Allen married Nov. 13, 1805, Mary, daughter of Deacon James Morrill (1751-1833) of Boston. 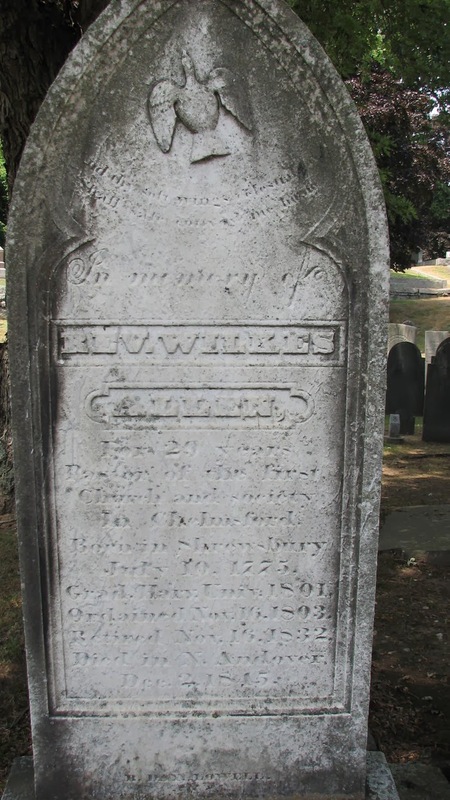 She was born Feb. 20, 1779, and died in Cambridge, Mass., Jan. 5, 1864, but was buried in Chelmsford. 117. i. JAMES MORRILL, b. Oct. 5, 1806. 118. ii. CHARLES HASTINGS, b. March 11, 1809. 119. iii. WILKES, b. Dec. 30, 1810.
iv. JOHN CLARKE, b. Nov. 15, 1812; graduated from Harvard College in 1833 in the class with Daniel Webster's son Fletcher, but d. the following year (June 26, 1834). v. ISRAEL, b. Nov. 27, 1814; d. young. 120. vi. NATHANIEL GLOVER, b. Jan. 23, 1816.
vii. MARY, b. Feb. 26, 1818; d. Sept. 9, 1821.
viii. SARAH, b. 1820; d. 1825." "ALLEN, Rev. WILKES, (s. of Elnathan,) grad. H. U. 1801; ordained min. of Chelmsford, Nov. 16, 1803, and dis. at his own request, Oct. 21, 1832; d. in Andover, Dec. 2, 1845, aged 70. His wife was Mary, D. of Dea. James Morrill, of Boston, m. Nov. 13, 1805. Chil. James Morrill, b. Oct. 5, 1806; Charles Hustings, March 11, 1809; Wilkes, Dec. 30, 1810; John Clarke, Nov. 15, 1812, grad. H. U. 1833, and d. June 24, 1834; Nathaniel Glover, Jan. 22, 1816; grad. H. U. 1842; and three others, who d. infants."